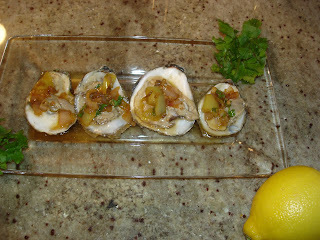 Oysters make the perfect small plate, appetizer or snack. They are actually very easy to prepare, if you live near the coast and have access to freshly caught oysters, because they really don't need very much garnishing to prepare. My favorite oysters are the small, bite-sized ones, like Blue Point and Kumamoto. Kumamoto oysters are actually a Japanese import that are widely cultivated in the Pacific Northwest. 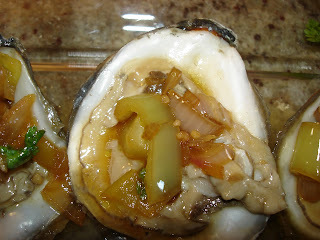 Blue Point oysters, are a local Long Island catch, and thus, my choice for preparing this appetizer. To learn more about oysters and different types of oysters, click here. Don't forget that you will need a shucker as well. The cilantro, soy sauce, champagne vinegar and sesame oil in this dressing will give your oysters an asian infused feeling. To prepare this recipe, heat the olive oil with the shallots, garlic and anaheim chile until soft for a couple of minutes. Add the sesame oil, soy sauce, sugar and champagne vinegar over heat for about a minute. Then add the lime juice and cilantro and allow to cool. Then spoon the dressing over the Blue Point Oysters. Perfect. This is a simple eye catching appetizer or snack. Just make sure that you only use a fresh local catch and prepare the same day that you purchase. I should mention that normally you shuck an oyster with a special oyster knife or shucker. However, I just has my local fish guys at Ocean Fish Market in Park Slope shuck and half-shell the oysters for me, which was really much easier.